Many thanks to Paul & Claire Morgan and their children for kindly supplying us with lovely nibbles on Christmas Eve at TBYC. I hope your all having a great Christmas. I am hoping to sail my Hurricane at this years Frozen Sheets to work the turkey and mince pies off, but Sophie and I are down for SS7 instead. Does anybody wish to take SS7 out? (you will need a crew) or can swap a duty. Had enough of cooking at home over Christmas. So don’t forget that Lesley will be catering at Lunchtime everyday this week, except New Years Day. She will continue with her popular offerings (there is no Turkey), however suggested that Friday maybe slightly restricted due to the Bank Holiday. Don’t forget on New Years day the Committee will be cooking and serving Brunch between 11:00 and 13:00. 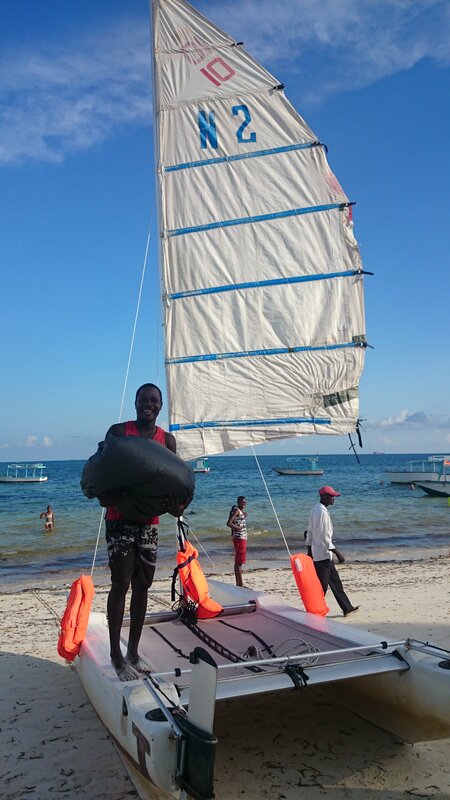 Nick Turner and family visit Mombasa, Kenya on a regular basis and he doesn’t miss the opportunity to go sailing. 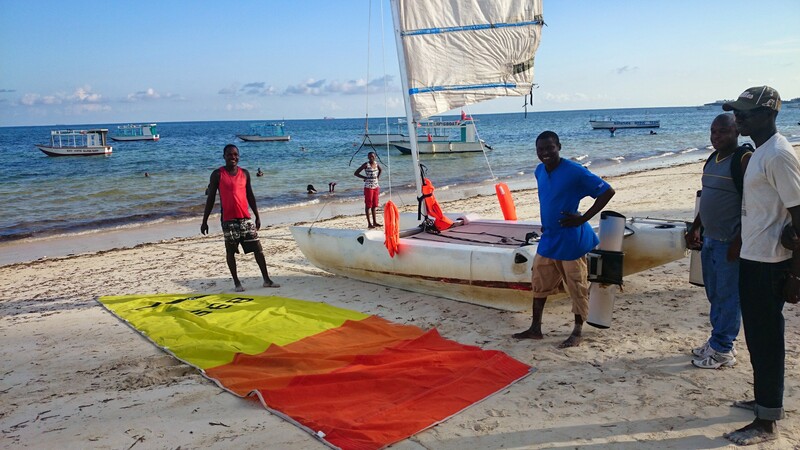 There are 4 or 5 Darts/Sprints type boats there that are owned by guys sailing tourists out to the Mombasa reef which is a sand bar 2 miles out from the coast. 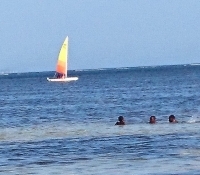 They also taxi tourists about for a quick sailing experience plus a bit of snorkeling. Basically anyway they can make a bit of money as they are desperately poor. In Thorpe Bay Nick had asked around for any old fully battens sails and as Richard Sands had just changed his Sprint 15 sail happily passed it on. Nick then flew out with the sail to pass on as a gift. You can see by the photos the expression of pure delight of having a Dacron made sail in his hands. And the crowd of 10 praising Nick kindness – all repeating “God Bless you” and different variations of it, God Bless your family – God bless you for a hundred and fifty years. We had to be there as this story does not give it justice. We are pleased to announce even without a caterer there will be a New Years Day Brunch – enjoy a “recovery” brunch cooked and served by club and committee members! Between 11.00am and 1.00pm on 1st January, Martin Swindon and members of the General Committee (and family) will be in the kitchen for one day only (in fact two hours only!) serving full English breakfasts and other brunch options including Scrambled Eggs with Smoked Salmon (no pre-orders required) at only £7.50 per person (Children £4.00). 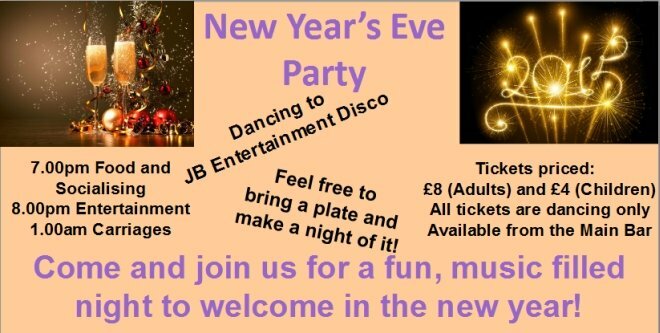 Tickets available now from the club bar – this is always very popular and restricted to 120 people, so please buy your tickets early to avoid disappointment (no later than 30th December 2014). The bar will be open and will also be serving Bucks Fizz, Bloody Mary’s and all your other favourites. Sunday was 25 mph Gusting 35 mph but was the challenge for Chris Boshier in his Contender and four Sprints to head off to Leigh on Sea. A big well done to Chris for defending the trophy and taking it for the second year and to Daren Fitchew who took second place. We understand that a few other club sailors were also in contention but had been disqualified due to mark errors. Thanks also goes to Toby and our safety crews that escorted our sailors for the day. Finished the packing, planned the cooking. 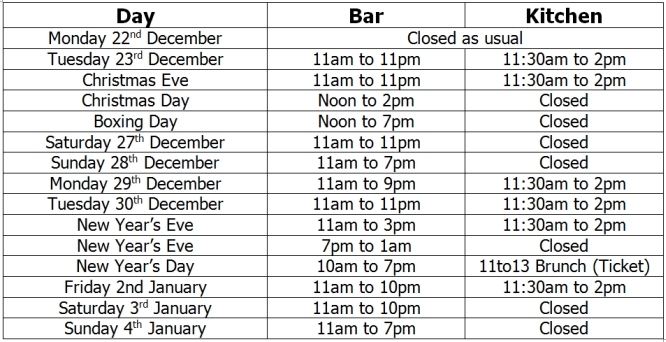 Why not come down, have a break and spend some time at the club on Christmas Eve. The Bar will be open with some nibbles and mince pies. What a good time to get together and have a chat with friends. The start will be at 10:30. HW 11:40. Briefing at 09:15 in the club house. Entry is £10 per boat – in advance if possible or at least send your completed entry form to [email protected]. The race will be run as an average lap race so that everyone gets roughly the same time on the water be you in a fast or slow boat. Prize giving to be at about 14:30.